Do you want to get The Last Best Box or send it as a gift, but can't wait until the next month's box is shipped? Consider one of our September "Helena" Boxes! 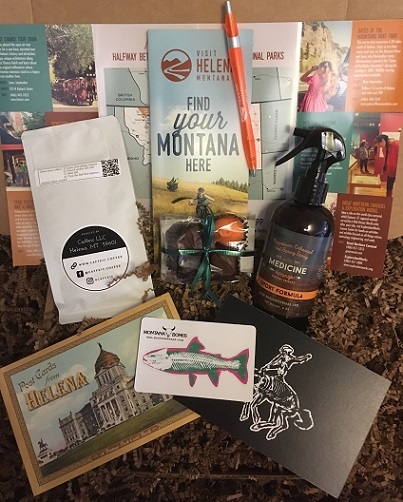 It includes Magnesium Enhanced Hot Spring Spray from Medicine Springs (Helena), a Vintage Helena Post Card Book from Farcountry Press (Helena), Candy Sampler from The Parrot Confectionery (Helena), Burundi Coffee from Caffeic Coffee Roasters (Helena), and a Bucking Bronco Postcard and Trout Sticker from Montana Bones (Helena). We use USPS 1-3 priority mail, and generally ship your box 1-3 days after you place your order. Contact us if you have any special instructions or questions. Cheers!